Office-friendly cabinet version provides the ultimate in portability and ease of use. 3-gallon vacuum included. Evaluated by the NSA and meets the requirements of NSA/CSS specification 04-02 for optical media destruction devices and 04-01 specification for key tape. Up to 70 lbs. per hour. Evaluated by NSA and meets the requirements of NSA/CSS specification 02-02 for disintegration. This high security, versatile office disintegrator is designed specifically for the destruction of data that resides on small storage devices such as flash media, thumb drives, solid state chips, optical disks, simm modules, and more. Evaluated by NSA and meets the requirements of NSA/CSS specification 02-02 High Security Disintegrators for Paper and NSA/CSS 04-02 Optical Media Destruction Devices. This SEM disintegrator has been designed to small storage devices such as flash media, thumb drives, SSDs, SIM Chips, and more. Model DS-200 — Dual-Stage Disintegrator/Mixed Media Destroyer - NSA Listed for Key Tape, too! Evaluated by NSA and meets the requirements of NSA/CSS specification 02-02 High Security Disintegrators for Paper and NSA/CSS 04-02 Optical Media Destruction Devices. With an optional 5/64" screeen, the DS-200 is also NSA/CSS 04-01 approved for punch/key tape. Highest throughput of all SEM office disintegrators. Evaluated by NSA and meets the requirements of NSA/CSS specification 02-02 High Security Disintegrators and NSA/CSS 04-02 Optical Media Destruction Devices. The SEM Model 200 with Marine cabinet is our unique Model 200 Office disintegrator/media destroyer in a space saving configuration, just right for shipboard and other limited space locations. The Model 200 is also the only approved office machine that is practical for destroying key tape in quantity (2 or more canisters per month). It will destroy key tape by the handful, not just a segment at a time. Evaluated by NSA and meets the requirements of NSA/CSS Specification 02-02 High Security Disintegrators, NSA/CSS 04-02 Optical Media Destruction Devices, and 04-01 Punch Tape (with 5/64" screen). A specially designed feed opening is included to minimize overfeeding of larger solid state devices. Also capable of destroying CUI/official use only credit cards, ID badges, and Blu-Ray disks. 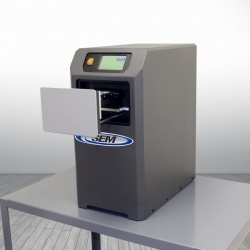 SEM's Model 0200 OMD/SSD is listed on the new NSA/CSS EPL for all optical media including DVDs and Blu-ray discs and can be purchased online for $2,999 GSA. This best-selling device is now also available in a cabinet version that includes the required vacuum inside an attractive, portable cabinet - perfect for office use. SEM’s NSA listed EMP1000-HS electromagnetic degausser offers best-in-class data erasure technology that fully complies with the first step of the DoD’s degauss and destroy mandate. In addition, all SEM hard drive crushers and shredders are noted on the NSA/CSS Evaluated Products List for HDD destruction devices as an approved solution for the deformation of magnetic media hard drive platters, offering full compliance with step two of the DoD mandate. 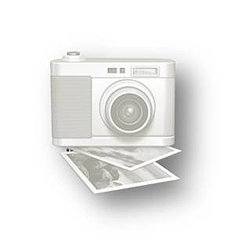 iWitness end-of-life media tracking tool records pass/fail status, magnetic field strength, and any number of user customized fields. 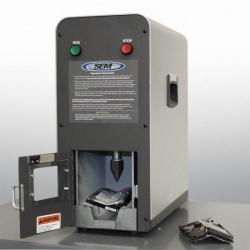 iWitness integrates seamlessly with SEM degaussers, hard drive crushers, and shredders. The Model 0202 OMD is a high capacity optical media shredder listed on the NSA/CSS 04-02 for CD destruction. It also meets DIN 66399 Level O-5 standards. The unit produces a residual particle size of 2.0mm x 3.9mm at a remarkable NSA tested 2,400 discs per hour. Large destruction chamber accepts drives with rails and handles.